ASHTABULA - Gerriann Kiphart, owner of Cake and Candy Connection, is looking forward to continuing her bakery business from home as she has done before for eight years. Kiphart’s business was located at a different building on Lake Avenue back in 2001 for about ten years before moving to another building on Columbus Avenue in 2011. From there, she remained for a few years until moving back to her current location at 2320 Lake Avenue in Ashtabula. “The business suffered when I re-located to Columbus Avenue. It was out of sight, out of mind,” said Kiphart. At the current location, Kiphart sells, aside from her bakery, cake supplies, food coloring, decorations, chocolate molds, bags, suckers and containers for bakery. “This store is more limited than the one I had before. People don’t want the equipment I have when they can buy it from Wal-Mart or JoAnn’s,” she said. Although the storefront is closing, Kiphart remains hopeful that her business will flourish at home. Kiphart has her baking licensure to work at home where she has a large kitchen and two conventional ovens that help make her four-tiered wedding cakes and thirteen types of cookies. She bakes a wide variety of cookies, including lady locks, butter balls, buckeyes, seven-layer bars, and nut rolls. Due to her Italian heritage, Kiphart also enjoys making frosted biscuits, pizzelles and anisette cookies. “I’ll make anything people ask for. All cookies are the same price,” she said. Growing up, Kiphart’s mother was always baking and she never recalls a time when her mother wasn’t baking cakes for fun. “I picked up my love of baking from her,” Kiphart said. Kiphart has attended various baking seminars and classes to help build her decorating skills and recalls a time when she couldn’t make roses quite like her mother could out of frosting. Even after her mother showing her, Kiphart decided to take a class where she learned, finally, how to master the art of rose creation. One of Kiphart’s favorite services to provide are creating weddings cakes. “The more unusual the design, the more challenging they will be and I enjoy being challenged,” she said. The cakes are made to order and she will work with whatever design is thrown at her. She begins her process for cake baking on Thursday and fully decorates the cake by Friday evening so it is prepared for Saturday’s celebration. “It’s not unusual for me to have four weddings on a Saturday,” Kiphart laughed. “During the two weeks before Christmas, I make at least one thousand pounds worth of cookies. It’s my busiest time of the year,” Kiphart said. 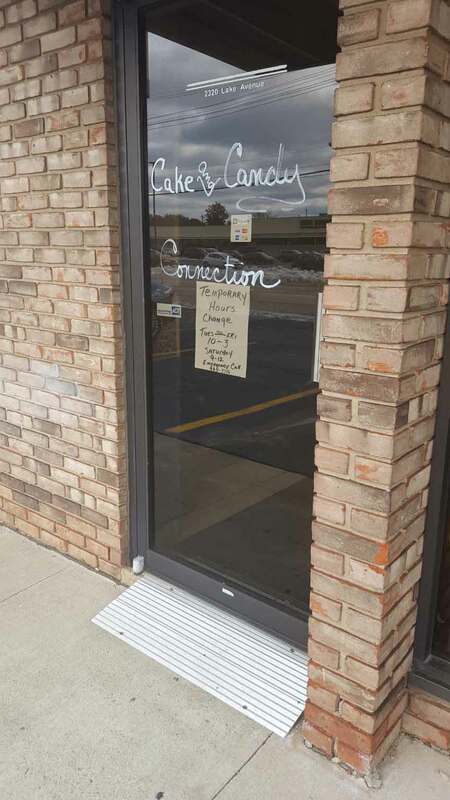 The Cake and Candy Connection storefront will remain open Tuesday-Friday, 10 a.m. to 3 p.m., and Saturday from 9 a.m. until 12 p.m. until the end of December. The store hours are Tuesday through Friday, 10 a.m. to 3 p.m., and Saturday from 9 a.m. to 12 p.m.